This little guy is a thorn in the side of Big Energy and the Republican politicians that serve it. Why? It was able to unite hunters, ranchers, land owners, local politicians, the USDA, the Audubon Society, universities, and even ConocoPhillips to prevent it from being listed as Endangered. Which probably ensured its long term survival. Wait, what? This bird is the sage grouse, colloquially known as the prairie chicken. And a more unlikely player in nationwide political intrigue you will not find. As the name suggests, it lives in the sagebrush that blankets western states, where it blends in so well that most of us will never see one. To better spot predators, its eyes are mounted on the sides of its head, which gives it both poor forwards visibility and a predisposition for running into fence posts. As a prey species for all sorts of predatory birds and mammals, it plays an important role in the ecosystem, but its real significance lies not as dinner for coyotes. 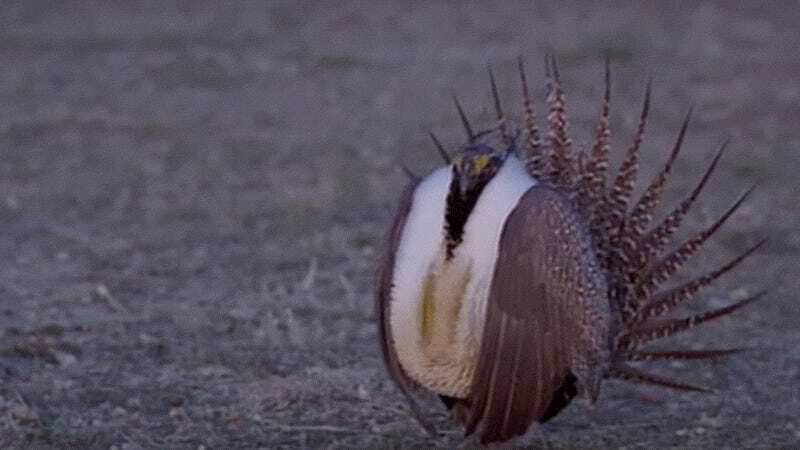 The sage grouse is an “indicator species;” the fate of the sage grouse is closely linked to the fate of the vast sagebrush ecosystem as a whole. And to save that ecosystem, they needed to keep the sage grouse from being listed under the Endangered Species act. Why? The unique sagebrush ecosystem — the whole thing — is under threat by energy development. As it spans the West, it also spans fields of oil, natural gas and minerals. And access to those resources is the subject of a fierce and nuanced political battle. And those invested in energy exploitation would have seen the sage grouse being listed by the Endangered Species Act as a victory along the way to gaining further access. Had the grouse been listed as Endangered, it would have shut down rancher access to grazing on public lands, restricted access for sportsmen and imposed limitations on the kinds of ways private land owners can use their property. That’s one reason why these disparate groups united around the issue. The other is because they also don’t want to lose the public lands they rely on for their livelihoods to private interests, and implementation of the ESA would have helped energy developers and the politicians they own in their quest to sell off your public lands. How do you prevent an animal from being listed Endangered? You work to foster conservation, protecting the species from the wide range of threats it faces. The Sage Grouse Initiative was formed in 2010 to help conserve the bird, you can read a full list of its partners here, it’s impressively diverse, and lengthy. Seriously go read it, it will surprise you and it’s as good an argument as any for all this being a good cause. Fearing the success of such a large, well-funded and organized initiative, energy companies fought back. And they were clever about the way they did it. In April, 2014, with the Fish and Wildlife’s ruling on sage grouse ESA protection looming, Sen. Corey Gardner (R, CO) introduced a bill called the Sage Grouse Protection and Conservation Act. It wanted to do for protection and conservation what the Patriot Act does for patriotism, calling for the USFWS ruling to be pushed back six years. Just this afternoon, it was announced that the provision will not be included in the version of the NDAA the House and Senate just compromised on. In this case, the looming ESA deadline was the stick that got people organized into the Sage Grouse Initiative. And it worked. Last week the FWS announced the results of its 12-month study: “We find that listing the greater sage-grouse is not warranted at this time.” The Initiative had won. Don’t underestimate the significance of that sentence. With that ruling FWS saved not only the grouse, but also probably the Endangered Species Act too. “The Sagebrush Sea” is an ecosystem that spans vast tracts of the American west. So how will the grouse and the ecosystem it inhabits be protected without the ESA? The Bureau of Land Management and Forest Service have announced a plan that will restrict energy and mining development across 165 million acres of their habitat, spread across 11 states. That economic exploitation of public lands is where the Koch brothers, Exxon Mobil and other energy and mining interests come into the story. They’ve begun a political push to see vast tracts of land across the west sold off by the federal government and opened up for energy development. Beyond all the nation’s heritage arguments, doing so wouldn’t make financial sense. Those lands support the $650 billion a year outdoor recreation industry, helping it create 6.1 million jobs while also providing the billions of dollars in royalties energy companies currently pay the federal government to extract resources from public property. Getting rid of those royalties along with the regulation that comes with using public lands is the motivating factor in all this. So the sage grouse may have won this battle, but the war on public lands is not over. It’s going to be a big issue in the run up to the 2016 elections and one we plan on covering in depth. Make sure you see our previous coverage, listed below, and stay tuned for more.